The Holidays always seem to sneak up on us while we’re napping on the couch. It’s hard to believe that Thanksgiving and Hanukkah have come and gone and Christmas is literally right around the corner. 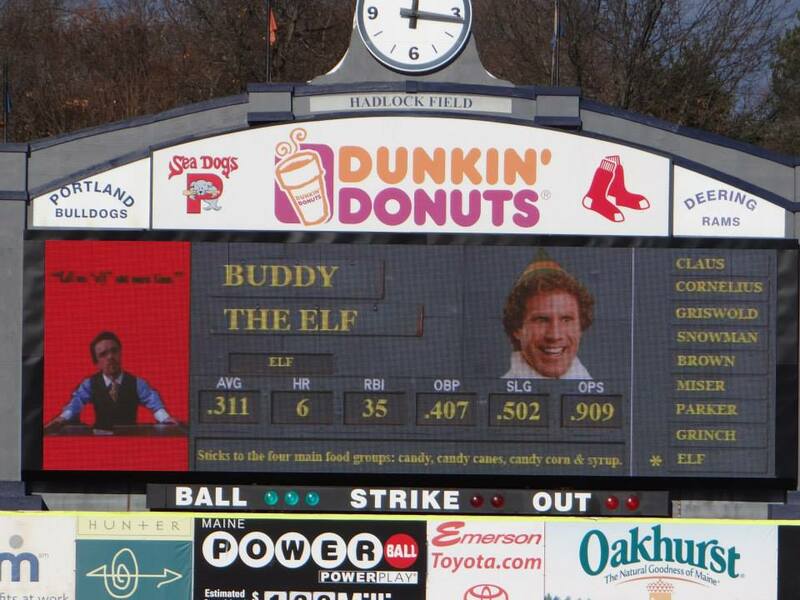 For the Sea Dogs’ staff preparations for our first Winter event, Holiday at Hadlock, are a sure sign that we need to get a move on our Christmas shopping. 2013 kicked off our third year of doing this wonderful free event, and it is definitely a staff favorite. If you missed the event this year, never fear, it is an annual event and one that we love putting on, so let’s plan on seeing you in 2014! Immediately after this event (and I mean, immediately) most of the staff jetted off to Orlando to take part in the Baseball Winter Meetings. The Winter Meetings are always a busy week, filled with networking with other baseball people from both the Major and Minor Leagues as well as league, committee and professional development meetings. Our next post will be about our week in Orlando, including the events and the major announcement on the final day. Until then everyone drive safe and gas up the snow blowers! 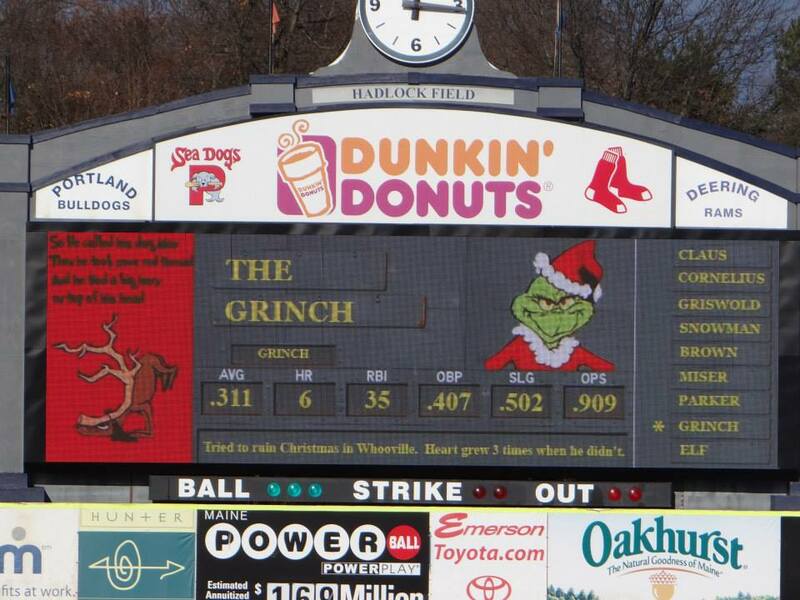 It was an exciting year to be a Red Sox affiliate for sure! Each season in Minor League Baseball is fun, but I will be honest, when your affiliate wins the World Series, it is REALLY fun. Especially when 17 of the 25 guys on the roster played for your team. 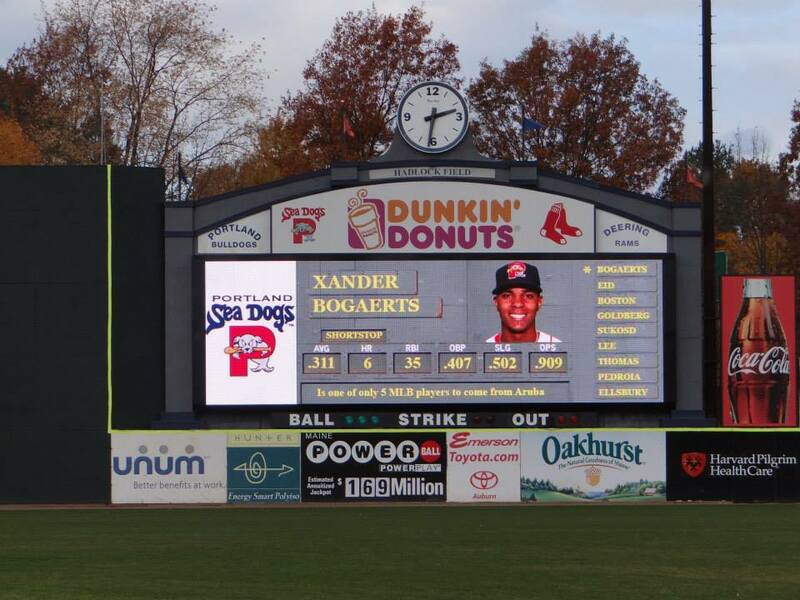 This season alone fans were treated to seeing Xander Bogaerts, Brandon Workman and Drake Britton before they were shipped to Boston. A preview of the 2014 Head Shots. So, the 2013 season was full of great players and great promos. To follow up on that, the 2014 season is looking even busier. 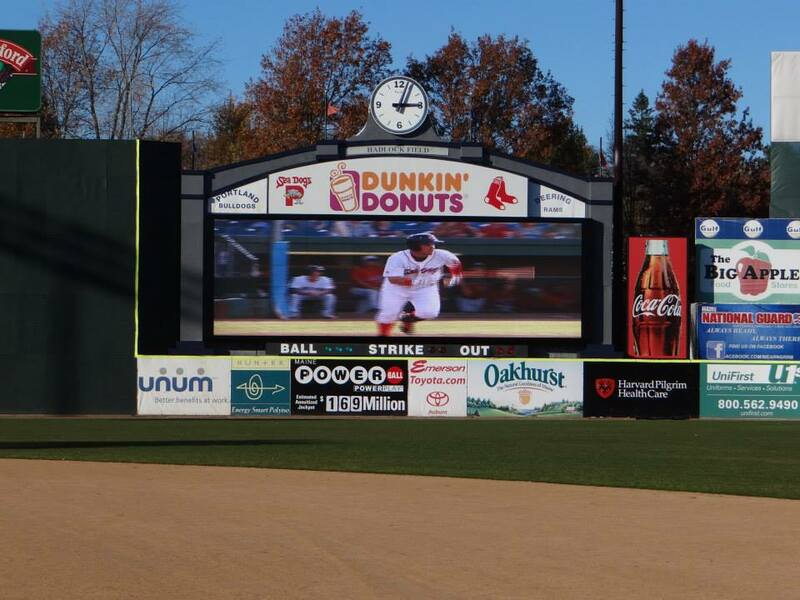 We just unveiled our new video board and pitch count sign. These capital improvements are still ongoing, but we wanted the lion’s share of the work to be done before the holiday season. It is literally a gigantic television in center field. Our promo crew, Slugger included, might have to invest in some high def make up. Getting ready for his close up. In addition to the new toys and gadgets we will have at Hadlock, we are also thrilled to welcome four new full time employees. Throughout the off season you will get the chance to meet them both in person and on the interwebs. 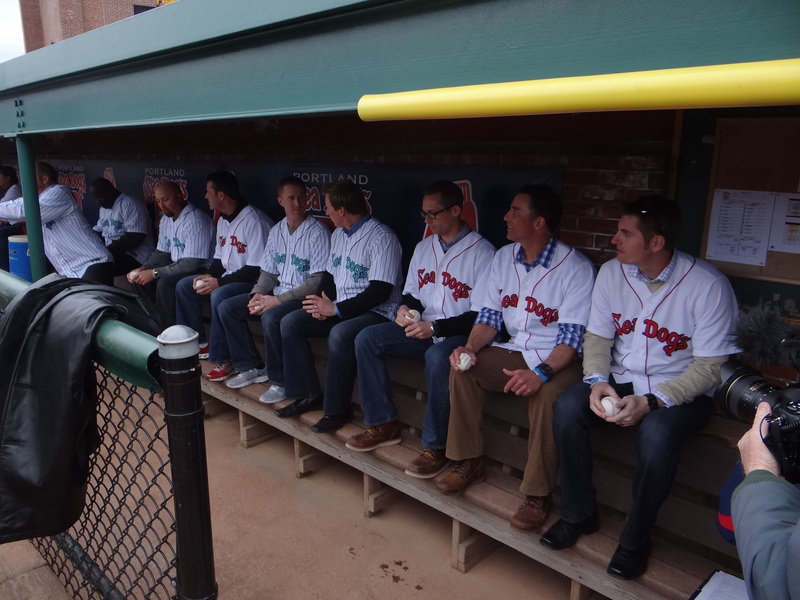 Alums patiently waiting in the dug out. Who doesn’t love a high five tunnel? Charles Johnson, chatting, anxious to go through previously shown high five tunnel. 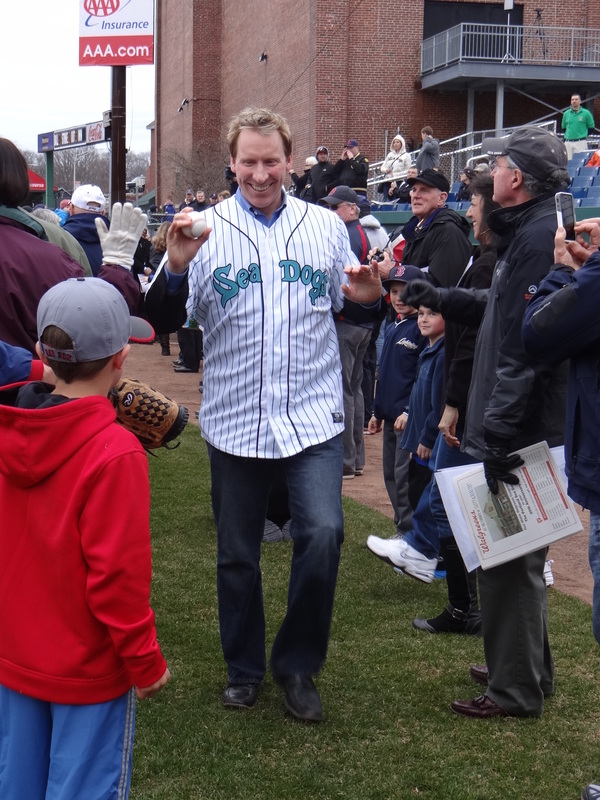 Portland Mayor, Michael Brennan saying a few words about the Sea Dogs. 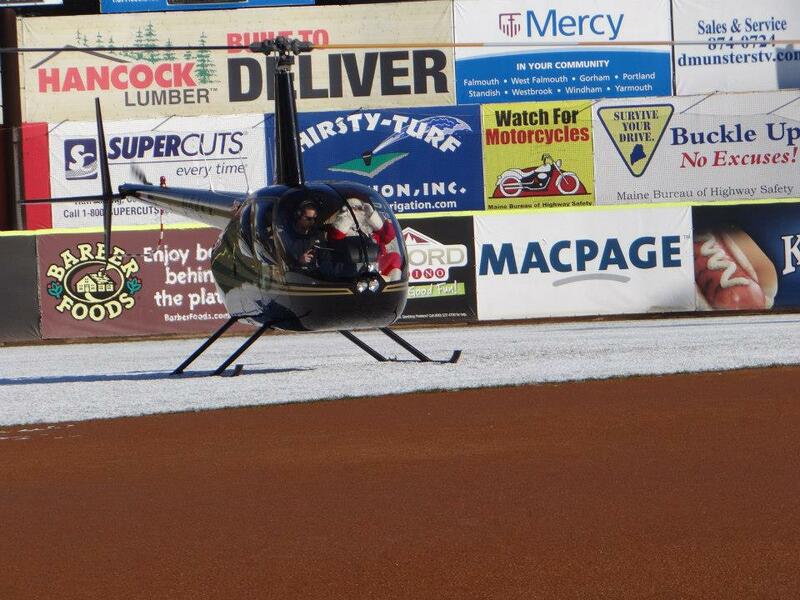 Our series with New Britain rolls on tonight when we welcome our Appreciated Teachers to the park! 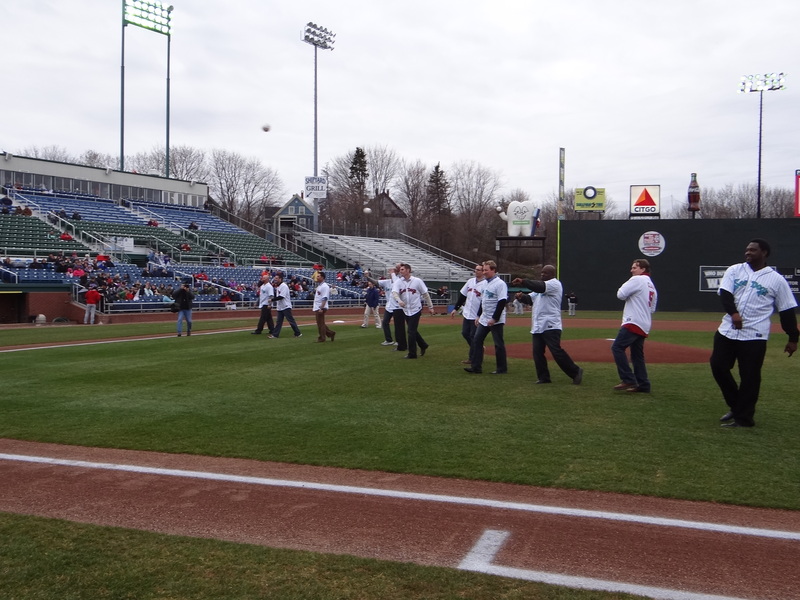 Teachers throughout Maine that were nominated by their Principals will be honored on the field before the game. Afterwards, they will be treated to chair massages in the Portland Room thanks to the fine people from Soma Massage. Teachers are selfless, so join us tonight for a big THANK YOU. The fun continues throughout the weekend with more games on Saturday and Sunday against New Britain, and then we take on the BMets Monday, Tuesday and Wednesday. Plenty of fun to be had well into next week! 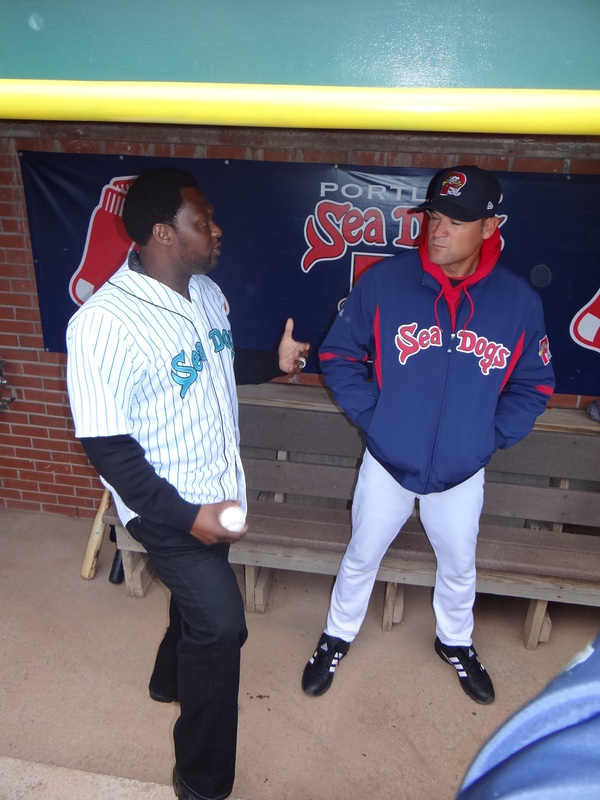 Tonight the Sea Dogs celebrate their 20th season of professional baseball in the City of Portland. Portland is opening up a seven-game homestand agains the New Britain Rock Cats (Twins affiliate), and looking to go over .500 for the first time since winning the 2011 opener. Sea Dogs pitchers Anthony Ranaudo @anthony_ranaudo and Brandon Workman @b_workman12 doing a great thing for Boston. Give them a follow and help the cause. Have You Seen the Maine Event? Debut of the Q97.9 Sea Dogs’ Dance Team! 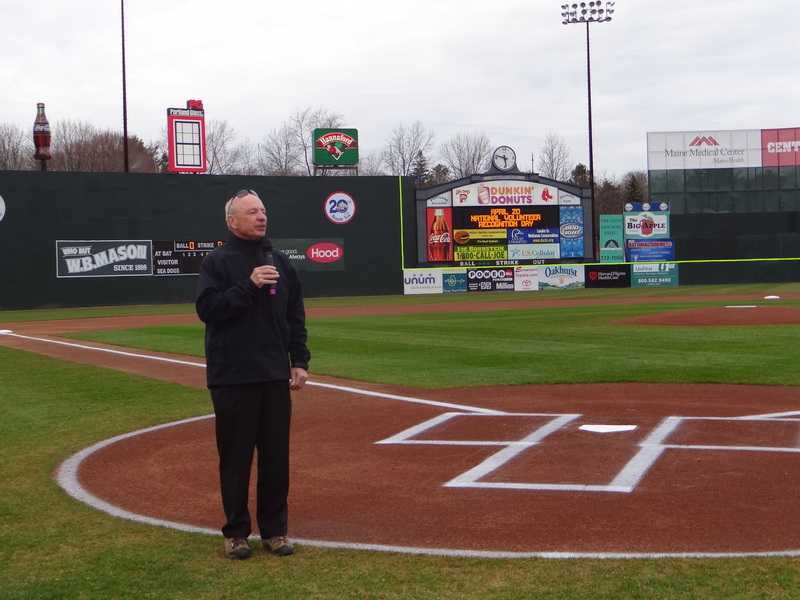 It was an early morning at Hadlock Field today, with Assistant General Manager/Media Guy Chris Cameron and I opening up the park at 4am to welcome our early morning media visitors. Each Opening Day I am consistently impressed and grateful for the level of coverage that we receive from all of the local media. They all do a fantastic job and in spite of the hour we have a great time. Opening Day is incredible for many reasons. It is a tangible way to give winter a big going away party and mentally prepare to move into the next season. In a lot of ways it is the unofficial start of summer. Also-little known fact-calories do not count on Opening Day, for front office staff AND fans. I am embarrassed to say what I had for breakfast, but I can tell you I am already looking forward to French Fries and a Sea Dog Biscuit for dinner. For this entire homestand we will have some great things going on at the ballpark. Tonight we will welcome long-time announcer Dean Rogers to th e park to throw out our ceremonial first pitch. This is a huge deal for us, as Dean announced almost all of our first pitches for 19 seasons, and it will be a delight to have him be the center of attention. Dean’s history in baseball and broadcasting is impressive and I am looking forward to spending some time with him and his family at the park tonight. Also, the Q97.9 Sea Dogs’ Dance team will make their debut at Hadlock Field this evening, donning their uniforms thanks to Classic Flooring. This group will be so exciting to watch at the park this year. On Friday night we will have the band 43 North performing in the front plaza before our 6pm game. They are a true friend to the Sea Dogs and a really fun Country band that plays some great covers and will really set the mood as you head into the game. 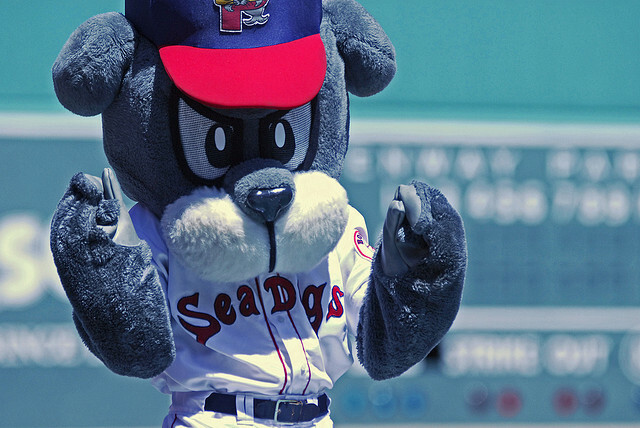 On Saturday and Sunday get ready for some day baseball as the Sea Dogs are set to finish off their series with the Trenton Thunder at 1pm on both days. Who doesn’t love some day baseball? On Saturday we have a front gate giveaway of our 2013 Magnet Schedules, thanks to Paul G. White. The magnet schedules this year feature two key players and look great on any refrigerator. Also on Saturday, The Kastaways will make their debut appearance in the front plaza. This year The Kastaways are sponsored by Moxie the Moose and Bugaboo Creek, so be sure to swing by and see your favorite band and special guests! On Sunday we will welcome Maine’s Public Universities and their Reading Challenge contestants, the Woodside One Wheelers and many other groups! On Monday we will start a new series against the Reading Fightin Phils and will have a very big National Anthem Group that evening comprised of some talented musicians from around the state. Tuesday and Wednesday night ‘s games are both also at 6pm, with Tuesday night being our Pi Night with Portland Pie Company. On this night we will recognize some Maine students who participated in a competition this winter where they recited as many spaces of Pi as they could…from memory (3.14). The winning student (who memorized over 250 spaces) is going to go home with a YEAR of free pizza thanks to Portland Pie Company. If there had been prizes like this when I was in school Math might have been my favorite subject. On Wednesday we will finish up our first homestand as we celebrate our School Night at the Ballpark as well as our Dance Night with the folks from Dance Studio of Maine. So, lots of fun things going on this week, and throughout the entire season. 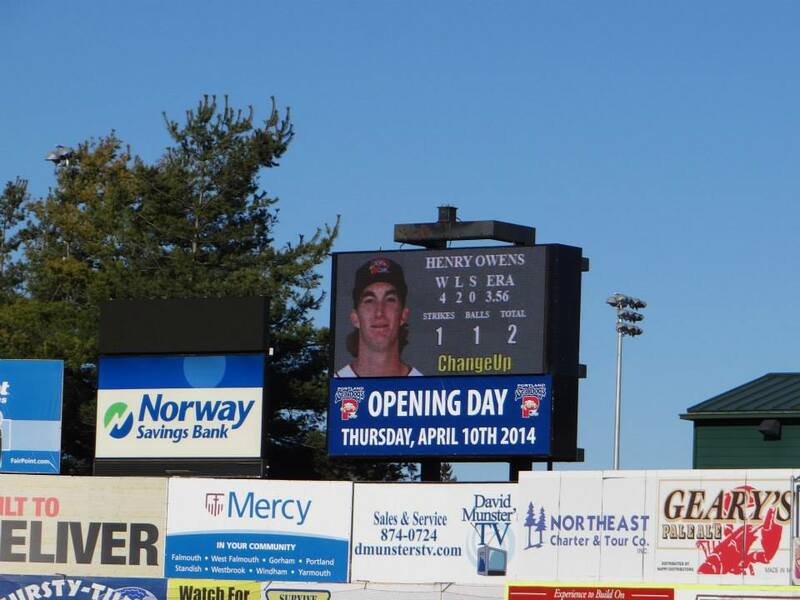 Check out more on our promotional website here: http://www.milb.com/promotions/index.jsp?sid=t546 and as always feel free to email me with questions at lriley@seadogs.com. Slugger, unlike me is keeping his new years resolutions and working out! 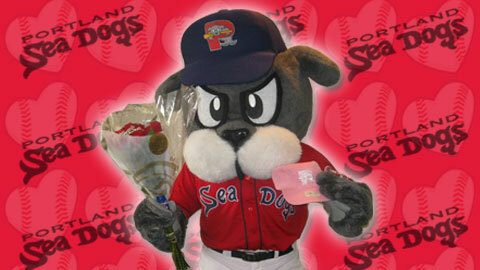 Be on the look out for a furry seal friend out there gifting roses, Sea Dogs hats and tickets. Remember, only 49 more days left until Opening Day! We are putting the finishing touches on many promotions as we speak! Valentine’s Day Packages on sale soon, but Slugger is ready.